Use title-style capitalization for titles, sentence-style capitalization for all other UI elements. Doing so is more appropriate for the Windows Vista tone and its more descriptive use of text. Exception: For legacy applications, you may use title-style capitalization for command buttons, menus, and column headings if necessary to avoid mixing capitalization styles. Exception: For legacy applications, you may use title-style capitalization if necessary to avoid mixing capitalization styles. One does wonder how much attention Microsoft pay to these guidelines. 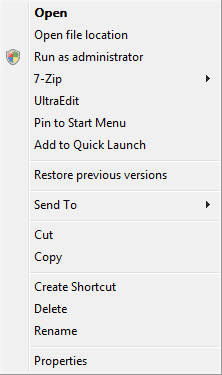 Let's take a look at the context menu for a shortcut to a application in Windows Explorer on Vista RTM + updates. Ignoring the entries from 3rd party software, what do we find? Mixed capitalisation styles. In sentence-style, we have "Run as administrator", "Open file location" amongst others. In title-style we have "Pin to Start Menu", "Create Shortcut" amongst others. It does looks somewhat unclean and why they left it like this can only be described as a mystery. 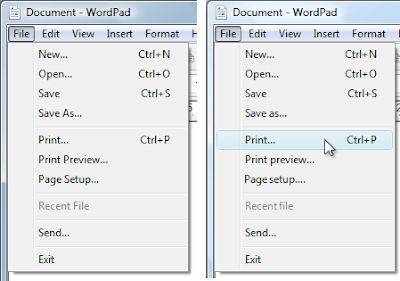 In this screenshot, WordPad in Vista is on the left, and from the article is on the right. At least part of the UX guidelines were written after Vista was released, so perhaps these changes should be looked out for in Vista SP1. In this example, halting the copy leaves any copied files, so the command button should be labeled Stop. If you've tried to cancel a file-copy operation in Vista, you'd realise this is talking about the actual behaviour in Vista.